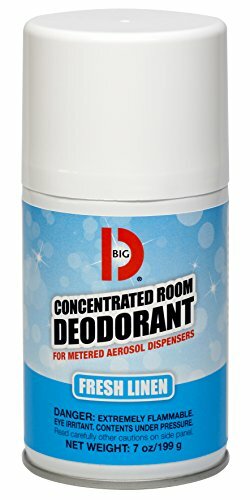 Big D CONCENTRATED ROOM DEODORANT FOR METERED AEROSOL DISPENSERS is a true odor counteractant specially formulated for industrial and institutional needs. Its formula complies with all federal and state environmental regulations, including those of California. Our special deodorizers neutralize odors rather than mask them. The uniform actuator valve enables the aerosol canister to be used in most metered aerosol dispensers. Each 7 oz. can contains approximately 3400 sprays and effectively deodorizes a 6000 cu. ft. space.